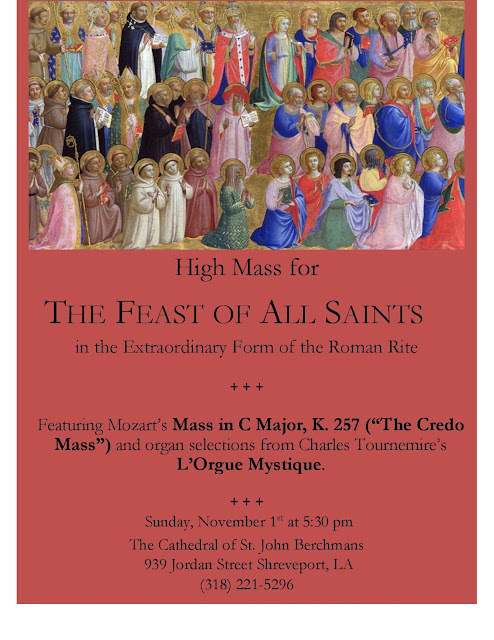 The Cathedral of Saint John Berchmans in Shreveport, Louisiana will have a High Mass in the Extraordinary Form, sung by members of the Cathedral Choir and also members of the Shreveport Symphony Orchestra. Mozart’s Missa brevis in C-major (“Credo Mass”) will be sing, and selections from Charles Tournemire’s Orgue Mystique will be played. Click here for more details, and see the poster below.